Not all death metal bands were influenced by the late progression and modernized sound of the style. Pentacle was another late arrived old band, and they preferred to stay at the old school sound of death. 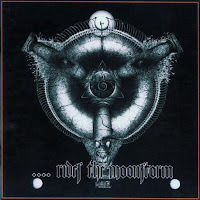 Their intense, strongly thrash influenced music refers to one decade earlier, when death metal was born, so "...Rides the Moonsorm" is like an excellent nostalgic album. Since thrash metal almost completely disappeared from the main scene (except a few old bands), it sounds refreshing too. And all made straight by authentic old school musicians. The themes often referring to Celtic Frost, but the influence of Asphyx is also mentionable mainly because of the vocal style. Frontman Wannes Gubbels' growling style was very similar to Martin van Drunen's suffocating voice. That didn't avoid the attention of Asphyx either, so lately Mr. Gubbels found himself in that band too for a while. From aggressive hammering they sometimes switching to slower middle speed, which occasions are the most common source of the Celtic Frost influenced themes, and increasing the effectiveness of their music. A stunning nostalgic album for the old school fans!